San Antonio, TX, 2017-Aug-07 — /Travel PR News/ — San Antonio’s array of attractions and historic sites, partnered with its dedication to accessibility, is making the destination one of the leading options for vacationers of all abilities. While attractions like Morgan’s Wonderland, the world’s first ultra-accessible theme park, are a big draw for vacationers seeking accessible options, visitors also will find that many of the city’s top cultural and historic sites are also accommodating. With wheelchair accessibility along the River Walk, theme parks offering sign language translation at shows, a sensory garden for visually impaired and exhibits specifically for people on the autism spectrum, San Antonio is setting the accessible vacation standard. San Antonio is home to five World Heritage-designated missions including The Alamo. Today, The Alamo strives to provide a memorable experience to every visitor. All public areas of The Alamo are accessible, and wheelchairs are available for check-out at the information desk inside the church, free of charge. For hearing impaired visitors, the film “The Alamo: Crossroads of Texas History” is shown with captioning throughout the day. Visitor Services staff are also happy to arrange an American Sign Language interpreter when requested seven days in advance. For visitors with sight impairments, an Alamo brochure is offered in Braille. Tactile experiences for groups and individuals are available with advance scheduling. San Antonio’s four additional Spanish colonial missions comprise San Antonio Missions National Historical Park. All of the major sites within the park are partially wheelchair accessible. Among these are the church sanctuaries with original frescos, restored living quarters, a mill, exquisite grounds, a museum and small theater that shows a film on the history of these beloved missions. Wheelchairs are available for use at each mission. San Antonio’s River Walk is a 15-mile, garden-bordered water channel that connects restaurants, hotels and historic sites—all while being submerged in a culture that is uniquely San Antonio. Since the early 1980s, the City of San Antonio has been eliminating architectural barriers and creating wheelchair accessibility along the River Walk. River barges offer narrated tours of this festive oasis. An accessibility map of the River Walk is available through the City’s Disability Access Office. Morgan’s Wonderland is a 25-acre theme park designed with special-needs individuals in mind and built for everyone’s enjoyment. Here, every guest with special needs enjoys free admission. The park’s carousel has specially designed “chariots” that allow guests in wheelchairs to go up and down. There are playgrounds with numerous types of slides and swings for people of all abilities, and a musical garden provides auditory stimulation while a quiet area adjacent to the lake offers respite from stimulation. 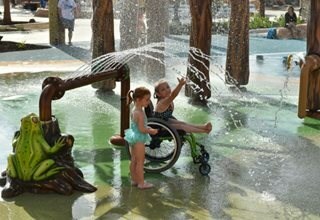 The world’s first ultra-accessible splash park, Morgan’s Inspiration Island, is an all-inclusive landscape that inspires people with special needs to do things previously thought impossible such as a river boat adventure ride with twists and turns through a jungle where bird and animal sounds fill the air. The experience continues with five water-play areas offering a variety of splash elements like raintrees, falls, pools, geysers, jets, water cannons and tipping buckets. SeaWorld San Antonio is a standout at providing services to guests with disabilities. Available online or at the park, their Guest Safety and Accessibility Guide provides helpful information to navigate rides, attractions and exhibits. When requested at least two weeks in advance, the park can provide sign language interpretation at live shows as well as park guidance for visually impaired guests. Wheelchairs are available for a nominal fee just inside the main entrance. Rest stops for service animals are also provided throughout the park. Visitors to Six Flags Fiesta Texas can stop by the hospitality center in Los Festivales where staff will be happy to help personalize their visit, provide guidance on what the park has to offer and share the “Guest Safety and Accessibility Guide,” which has detailed information on the accessibility of rides, shows, games and restaurants. Standard and motorized wheelchairs are offered for a nominal fee. Plus, the park hosts an annual deaf awareness day where all shows are interpreted. The San Antonio Zoo is one of the largest in the nation with more than 3,500 animals representing 750 species. Wheelchairs are available for a rental fee and staff is available to suggest experiences that may appeal to diverse audiences – from a rainforest environment where guests can engage with hundreds of brightly colored, nectar-eating lorikeets to feeding a giraffe. The 38-acre San Antonio Botanical Garden is an ideal way for visitors to connect with the beauty of the city’s rich landscape. Included is the Sensory Garden with particularly aromatic plants and sculptures that can be touched. This meandering garden is ADA accessible with wheelchairs available at no charge. The DoSeum is San Antonio’s hands-on museum for children. Almost every experience is tactile, as The DoSeum believes that children learn through doing. Sensory-friendly nights are offered four times a year where exhibits are modified for children on the autism spectrum, whether through dimming the lights or adjusting the sound system. Plus, The DoSeum’s treehouse is ADA accessible allowing children in a wheelchair to experience what treehouses are known for, inspiring views. All hallways, exhibits and restrooms also are handicap accessible. Located in a former brewery on the River Walk, the San Antonio Museum of Art has large collections of ancient Mediterranean art, Asian art and the world’s largest collection of Latin American art. The museum offers docent-led tours for the blind and visually impaired the first Saturday of every month at 10:00 a.m., or by special arrangement. Tours include descriptive language, touch, sound, and smell to enhance the visitors’ experience with art. Wheelchairs are available for use at no charge. The McNay Art Museum specializes in 19th- and 20th-century European and American art, while the extensive gardens are home to exquisite sculptures. Most galleries are wheelchair accessible and wheelchairs are available for public use. Guests with special needs can speak with staff in advance to have an experience curated based on what they’d like to see and discuss any inquiries they may have. Located along the banks of the San Antonio River, the Witte Museum is San Antonio’s premier stop for South Texas nature, science and culture. Having recently undergone a massive $100-million expansion and renovation, Witte visitors can explore numerous visual and tactile experiences in the Naylor Family Dinosaur Gallery, the H-E-B Body Adventure which helps to increase Health I.Q., The South Texas Heritage Center and other historic and cultural stops on this 10-acre campus. All buildings are handicap-accessible and wheelchairs are available on a first-come, first-serve basis. When exploring a city as historically rich and loaded with attractions as San Antonio, sometimes the best way is to explore is by tour bus. San Antonio offers several tour bus companies such as City Sightseeing San Antonio Double Decker Bus and Alamo Trolley, which provide ADA accessible vans. Visitors in need of ADA options can call in advance to secure their passage for tours that include stops at the Alamo, Hemisfair Park, Tower of the Americas, River Walk, Institute of Texan Cultures, La Villita Historic Arts Village, Market Square, San Fernando Cathedral, the Mission Trail and more. There’s more to discover. While in town, travelers can stop by the Visitor Information Center across from The Alamo to grab a map, get more ideas on what to explore and have San Antonio questions answered. Getaway packages, discounts and more information can be found at visitsanantonio.com. This entry was posted in Attractions, Business, Travel, Travel & Kids, Travel Management, Travelers, Vacations and tagged san antonio, vacation options. Bookmark the permalink.